Ons' LieveHeer op Solder is a stunning 17th century canal house, house church and museum. The place is located in the center of the city and sees a lot of tourists visiting the picturesque destination. The destination is great for photography and videography. Visit the destination and indulge in the magnificence and grandeur of the location and make some memories that will last forever. The museum is open to the public and sees 85,000 visitors annually. How popular is Ons' Lieve Heer Op Solder? People normally club together Nieuwe Kerk and Amsterdam Arena while planning their visit to Ons' Lieve Heer Op Solder. This museum experience was one of the quieter attractions I attended while visiting Amsterdam but it turned out to be one of my favorite adventures. I was able to immerse myself in the history as I explored the house at my own pace and listened to the audio. The audio narration system was really intuitive to use. I really liked some of the details like the paint chips in the wall from the restoration and the unfolding hidden podium. I still find myself talking about this tour a month after my trip and highly recommend going early in the morning when they open so you can have the place to yourself like I did. It was really neat to see how Catholics worshipped in the Netherlands in the past. The audio guide was good at explaining different aspects of the Catholic faith to those who might not know. My husband had been here 10 years ago and wasn't impressed, but the changes they have made since then made it well worth a visit. Absolutely beautiful experience. It was a privilege to be able to explore this secret gem of Amsterdam. The audio tour guide was very informative throughout the experience. After the tour, we went to the cafe (after being given a discount voucher for Apple pie, cream and a hot drink), the man who greeted us could not have been nicer. Very warm and welcoming, offering us a lovely selection of food and drink. The gift shop is also worth a visit! Thank you! This was amazing!!! The three 17th century houses you work your way through are really the highlights. The chapel was interesting but the houses were extraordinary. The museum has been beautifully put together and the audio guide was excellent. Very well worth coming. Great little museum. Very interesting history. 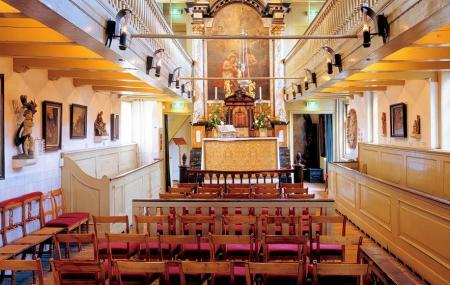 One of the very few secret churches in Amsterdam from that period. It is very well maintained, and there are also audio guides to explain the history behind the rooms and objects in the house.